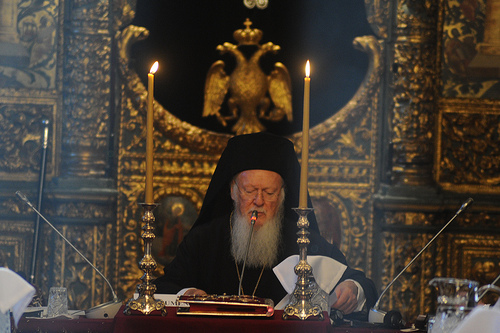 At present, the heads or representatives of all the Autocephalous Orthodox Christian Churches are engaged in a meeting (“Synaxis” in Greek) in the Phanar in Constantinople, at the invitation of the His All-Holiness Bartholomew, the Ecumenical Patriarch. This includes His Holiness Patriarch Ilia II. His assistant Father Giorgi Zviadadze, the Rector of the Tbilisi Theological Academy and parish priest of Sioni Cathedral, is also in attendance. Issues of overlapping jurisdictions in ethnically mixed regions have been a bone of contention for some time, that will no doubt be discussed. Georgia suffers from this issue, with both Georgia and the Moscow Patriarchate laying claim to authority over the Church in the Russian-occupied region of Abkhazia. Ukraine also has its share of jurisdictional issues, with Eastern Orthodox communities from both Moscow Patriarchate and the two other self-proclaimed autocephalous Ukrainian Patriarchates in dispute over many issues, including Ukraine’s territorial integrity and national independence. There are also differences of opinion on the merit of Orthodox Churches engaging in dialogue with the heterodox. The Georgian Church at this time has reservations about the value of such dialogue, whereas the Church of Constantinople is in general more enthusiastic about dialogue, particularly with Old Rome. The address of His All-Holiness, kindly provided here by the EP’s Hong Kong Metropolitanate, is carefully considered and gives a very good precis on current Orthodox thought on the balance between unity and local autonomy, and Christian values in the midst of a fast-changing world. One of the Thirteen Syrian Fathers (ათცამმეტი ასურელი მამანი, atsamet’i asureli mamani), Saint Shio established one of the largest monastic centres in central Georgia, the Shio Mgvime Monastery in Mtskheta, around 30 km from Tbilisi. 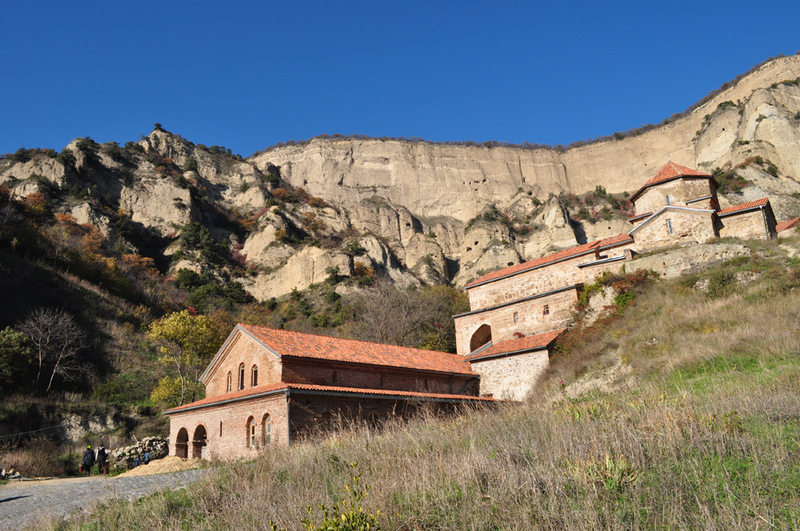 The monastery is located in a steep gorge outside the town. Many of the structures date to the late 6th century and are still in use as a functioning monastery. “The Monk Shio (Simeon) of Mgvim was born in Syrian Antioch. His parents were Christians and raised their son as the only heir. The youth received a fine education, he studied the Holy Scripture and already in his early years he became accomplished in the ability of expounding the Word of God. 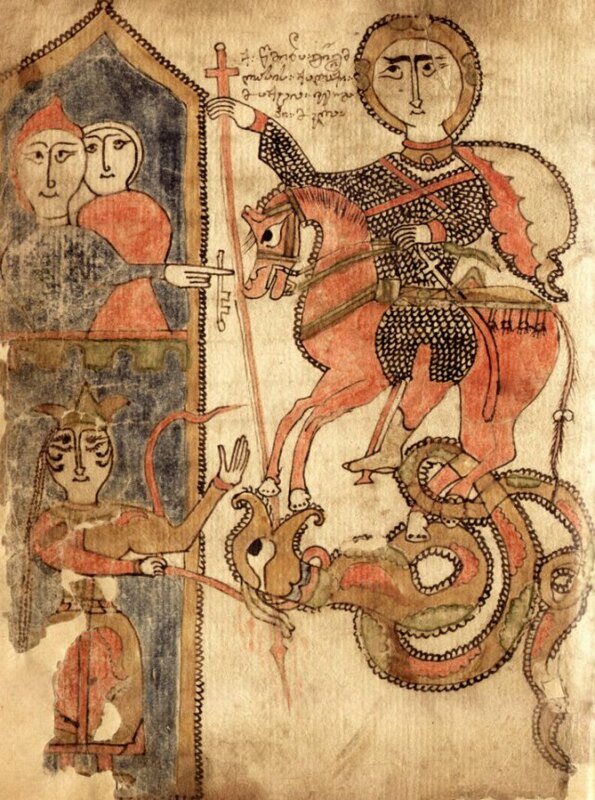 Having learnt about an holy ascetic named John, Shio secretly left his parental home and set out to the saint. The Monk John made the youth return to his parents, after foretelling that his parents would become monastics. The prediction was soon fulfilled: Shio distributed his inheritance and accepted tonsure from the Monk John. This saint is commemorated on the Thursday of Cheesefare Week (the week before Great Lent) as a movable feast, and also is commemorated in May. 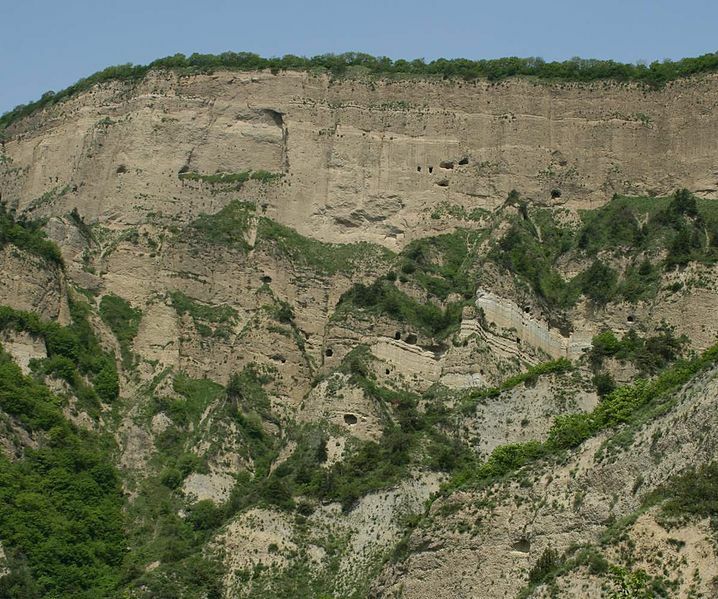 The monastery built upon the site of his original community includes many caves dug into the hillside. At one time if was the most populous monastery in the country with over 2000 monks in residence, with music, liturgical works and sacred literature composed here. The monastery has been attacked or the monks dispersed many times by Persians, Mongols and Turks, and was shut down by the Communists also. It is now once again a thriving monastic centre with many monks and pilgrims. Last Sunday began the three week-long Pre-Lenten period, where Christians consider the issue of repentance before beginning the rigourous fasting season of Great Lent. Last Sunday was designated as the Sunday of the Pharisee and the Publican, referring to one of Christ’s better-known Parables on the importance of knowing oneself, humility and repentance. 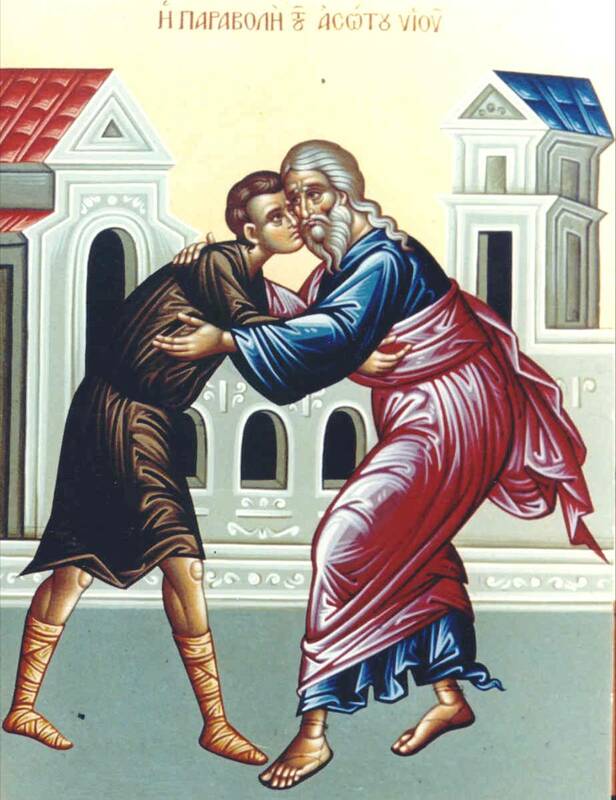 This week is designated as the Week of the Pharisee and the Publican, and next week follows the Week of the Prodigal Son (another parable concerning repentance and forgiveness). Luke 18:10-14 provides the parable, where two men, one from the Pharisee sect (known for their strict adherence to the Law) and the other a Publican (a Jew in the service of the Roman Empire as a tax collector, widely despised by Jewish society as collaborators and thugs, and considered ritually unclean) enter the Temple. The Pharisee, while praying, proudly tells God he is so happy that he is virtuous, and does not conduct himself like adulterers, extortionists or tax collectors, and that he engages in many good works. The Publican, in grief over his wicked past, begs God to forgive him and acknowledges himself as a sinner. Christ concludes that it was the Publican who returned home justified and forgiven, not the Pharisee, and He states, “Everyone who exalts himself will be humbled, and he who humbles himself will be exalted” (v. 14). A Greek word “metanoia” is frequently used when discussing repentance in this context. It means “change of mind” and conveys a deeper meaning of repentance than just self-pity, dissatisfaction or regret over past actions. It is an active process rather than a passive mood, involving transformation of one’s viewpoint and a re-appraisal of how we interact with God and with others. The Pharisee in this parable is self-satisfied, complacent and believes that his adherence to the Law and his good works are enough to maintain a solid relationship with God. The Publican truly seeks a “change of mind”, not only regretting his misdeeds but humbling himself before God and resolving to improve his conduct; through God’s mercy rather than only his own works he will be forgiven and hence saved. In our own church, we may meet people who resemble the Pharisee, who are unjustifiably proud of their piety and look down on overt sinners, are unkind to people of other religions or harsh to people of other races. It has ever been so, such is the nature of human frailty. We may also encounter people like the Publican, who have made serious errors in their lives, are frequently held in contempt for it, and humbly seek to transform their lives through Christ. Recapitulation of this parable before our eyes on a weekly basis should not make us cynical about the devout, but remind us that Christ’s parables are timeless and the struggle with pride goes on relentlessly in every human heart, even in people who are basically decent. The icon for this feast is full of significance, and an explanation of the didactic (teaching) icon above is well covered here. “When lately we made mention of the Pharisee and the Publican, and hypothetically yoked two chariots out of virtue and vice; we pointed out each truth, how great is the gain of humbleness of mind, and how great the damage of pride. For this, even when conjoined with righteousness and fastings and tithes, fell behind; while that, even when yoked with sin, out-stripped the Pharisee’s pair, even although the charioteer it had was a poor one. For what was worse than the publican? But all the same since he made his soul contrite, and called himself a sinner; which indeed he was; he surpassed the Pharisee, who had both fastings to tell of and tithes; and was removed from any vice. On account of what, and through what? Because even if he was removed from greed of gain and robbery, he had rooted over his soul the mother of all evils— vain-glory and pride. On this account Paul also exhorts and says “Let each one prove his own work”; and then he will have his ground of boasting for himself, and not for the other. He publicly came forward as an accuser of the whole world; and said that he himself was better than all living men. And yet even if he had set himself before ten only, or if five, or if two, or if one, not even was this endurable; but as it was, he not only set himself before the whole world, but also accused all men. On this account he fell behind in the running. And just as a ship, after having run through innumerable surges, and having escaped many storms, then in the very mouth of the harbour having been dashed against some rock, loses the whole treasure which is stowed away in her— so truly did this Pharisee, after having undergone the labours of the fasting, and of all the rest of his virtue, since he did not master his tongue, in the very harbour underwent shipwreck of his cargo. For the going home from prayer, whence he ought to have derived gain, having rather been so greatly damaged, is nothing else than undergoing shipwreck in harbour.